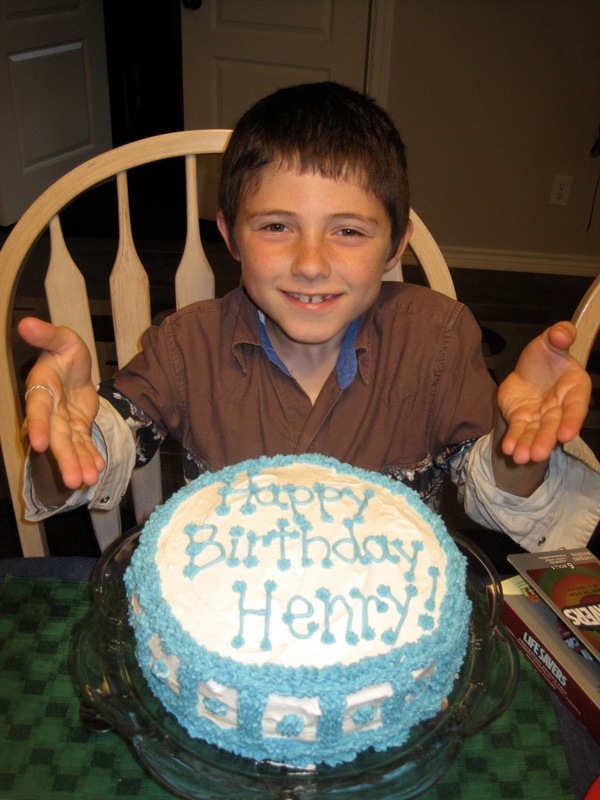 Henry's birthday always falls near the memorial day weekend...which has positives and negatives that go along with it. The weather is usually gorgeous, but lots of people are busy, busy, busy as they are kicking off festivities and welcoming in summer. The rodeo is usually in town the weekend before that, and Sky Ranch starts summer camp that weekend as well. This year, Henry invited his cousin Cole over to go to the rodeo with us and spend the night at our house. They had a blast at the rodeo, and we happened to have a field trip scheduled for the next day at the Sabine River Authority, so Cole got to join us for that as well. The following weekend (on the day before Henry's actual birthday) we had a small family party for Henry at the house. Henry requested white cake with blue icing, and ice cream cones with frosting a sprinkles on the side. 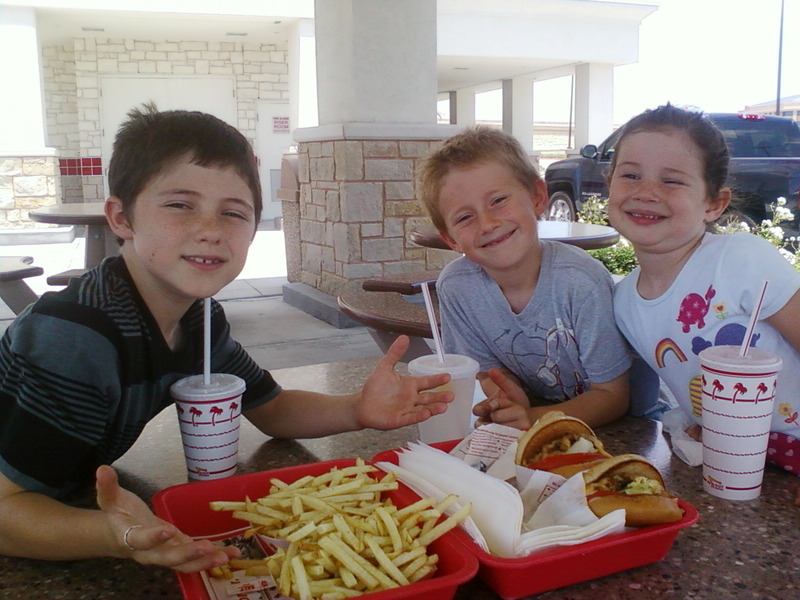 We made a stop at Henry's favorite place (that we don't have in our area), In-N-Out burger. It was super windy and kept blowing our napkins and french fries all over the place, but we had a great time anyway. I just love of my big 9 year old! Henry is so responsible that I sometimes forget that he is (only) nine years old. He continues to amaze me with his willingness to work hard, help others and watch out for his younger siblings. He has a natural ability to care for animals and he is athletically gifted and good at any sport that he tries. Henry reads his Bible every morning and diligently works on his schoolwork without complaint. He is friends with everyone he meets. Henry, I love you so much and am so very proud of you!!! 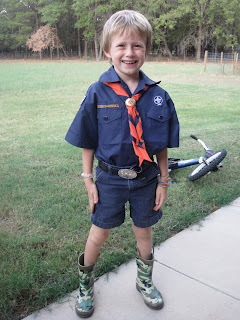 Sam and I ended up being Cub Scout leaders for the 2011/2012 school year. We were in charge of the Tiger Cubs (Jonah's troop). Henry was a Bear Cub in another troop. I'm not exactly sure how we got signed up to be the troop leaders, but we did enjoy the experience-especially the super cool shirts. Jonah was the reason we got involved with cub scouts in the first place. He had heard about it and thought that it would be the very best activity for him. Since Henry was involved in other sports at the time, we initially told him that he couldn't be in cub scouts, but it turned out that he could go on the same nights that we were there with Jonah. So it actually worked out wonderfully for everyone! Bridget came along with us to Jonah's class and was able to participate in the crafts and snacks and games. The cub scouts also had a chance to be in a parade! When we got to the meet-up place the morning of the parade, it was raining and kind of cold. Both my boys decided they wouldn't prefer to be in the parade after all, so we opted to watch from the sidelines. Some of the meeting were super fun, like the one where they brought in "The Creature Teacher", who let everyone touch a tarantula. Yuck! Before the big cub scout camp out, we had a tent-building meeting. The kids really enjoyed learning to put up a tent, and we packed them each a s'mores snack in a ziploc to enjoy while they played. Near the end of the school year, we had one final meeting and had everyone come to our house for a bonfire. The kids roasted marshmallows, met our goats, and ran around outside for a while. We had mostly city kids in our group, and they all really enjoyed coming out to our place and having some freedom to enjoy nature a bit. They all had so much fun! It was fun to be a cub scout leader for a season, but at the end of the year Sam and I passed the torch to another parent to take over the leadership. We decided that since we have so many other activities throughout the year that cub scouts wasn't the best one for our family. We also spend lots of time outdoors and enjoy the experiences they were focusing on as a family. We are thankful for the year that we had with such a fun group!